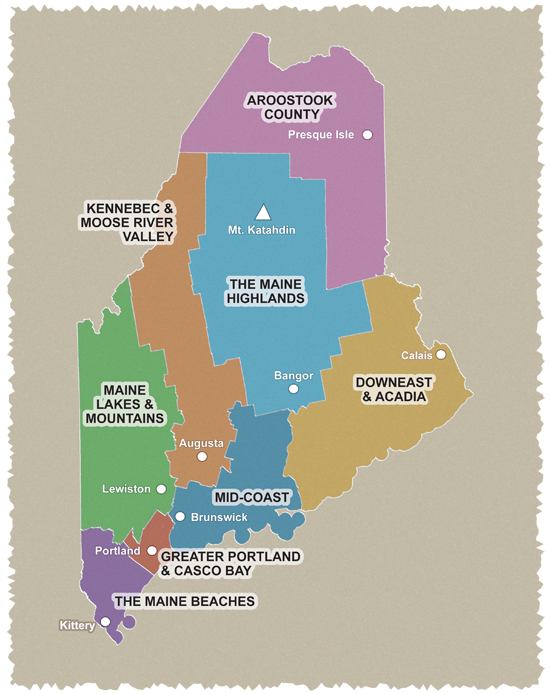 The unspoiled mountain vistas, placid lakeshores and majestic forests of Western Maine offer cyclists plenty of opportunities for sightseeing, museum visits and hiking. These bike loops pass over constantly changing terrain, with short steep hills and narrow winding roads that are reminiscent of southern New England. Bicyclists meander through wooded countryside, passing small ponds and streams. This is a great tour if you only have a few hours to ride. Approaching Buckfield, the route climbs up to exposed ridges permitting views of Streaked Mountain and the Oxford Hills. AAll loops start from the pretty four-season resort town of Bethel. The 14-mile loop is short and flat through a forested area south of Bethel. The 18-mile loop meanders along the Androscoggin River with great views of the countryside. The 33-mile loop takes you to one of the area’s most famous landmarks—the Artists’ Covered Bridge. The 67-mile loop is truly a classic northern New England ride—great during spring, summer, or fall when the leaves turn color. The 8-, 18-, and 30-mile rides explore the rural scenic landscape on both sides of the Ellis River. Each ride takes you to the Lovejoy Covered Bridge built in 1867. These three loops are easy to moderate rides, suitable for recreational cyclists. Old Speck Mountain guards the passage through Grafton Notch, one of many hidden scenic treasures in western Maine and a major sight on this challenging 53-mile ride. A marvelous network of country roads is hidden in the foothills of western York and Oxford counties where life seems to have changed little during the last century. This is quintessential New England—old stone walls and maple trees line the narrow country roads. Along the way, cyclists encounter river views, mountain scenery, and gracious old homes. Fryeburg is a unique one-day or multi-day trip destination packed with history, recreation opportunities, and great mountain views. The town is one of the oldest in the region and boasts 11 buildings listed on the National Register of Historic Places. The tour loops follow gentle country roads that meander through the Saco River Valley past farms, fields, and forests, with views of the western mountains.